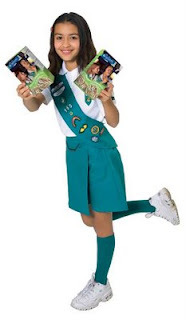 Let's ignore, for a moment, my bad experiences with the Girl Scouts. Let's pretend that my troop leader's daughter was not an overachieving twit who always sold like a thousand boxes of cookies. I'll set aside the fact that said troop leader liked to publicly compare our relative achievements. ("Oh, looks like Jamie only sold 199 boxes of cookies; not quite enough to get [whatever the hell prize 200 boxes of cookies entitled you to]. Too bad.") And we can totally forget the fact that my dad was into camping and we did way more fun/cool stuff (camping! shooting GUNS!) as a family than I ever did in stupid scouts. Why I really hate Girl Scouts is that every February, when I'm feeling down and draggy and really, really ready for spring, those damn be-sashed young women come bearing the comfort food of all comfort foods. And between my pig-out on Oscar night (cheese! crackers! cosmopolitans!) and the boxes and boxes of cookies at my house (I got six, my brother got six, my parents each got four), I am going to gain back the five pounds I've lost in the last four weeks. I'm off to the 24-hour Walmart to buy a padlock for the frickin' freezer. Did you stimulate the economy yet with a bike purchase? Hubby has a pair of 404's but he says you need the 808s!! After baking an apple pie, and getting a chocolate moose cake from my GFs parents, Sam brings home 4 boxes of girl scout cookies. Amazing timing, right?! Good thing it is the off season... ugh. girl scout cookies are especially satisfying when whipped overhand at overachieving twits. samoas, especially, sting like the dickens and leave a nice impression. you are SO right. i just cannot help myself.